Awards were presented to the following individuals at the Awards Banquet held at the Oregon Coast Aquarium on Friday, October 12, 2018. 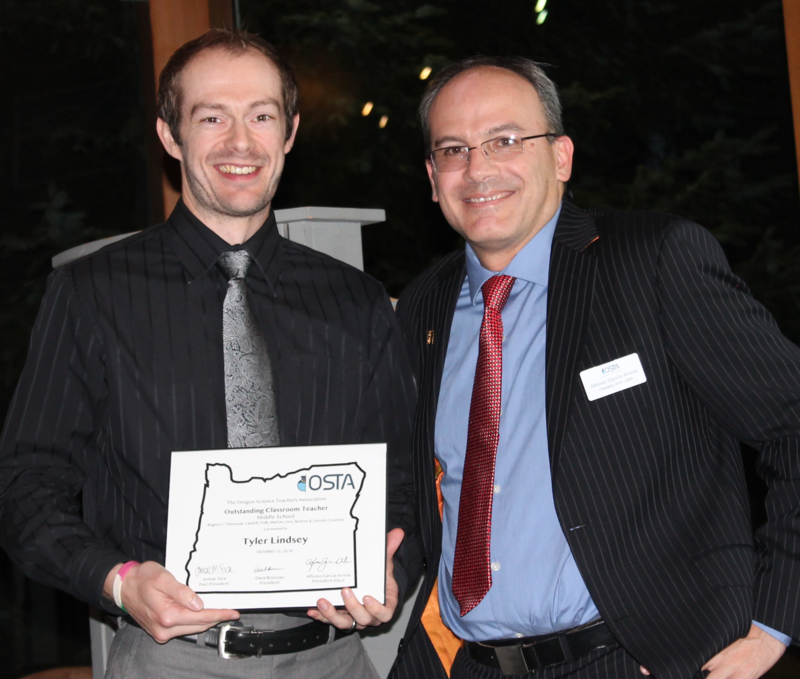 We are very proud to have these educators as members of the Oregon Science Teachers Association. The Presidential Award is the nation's highest honor for teachers of mathematics and science (including computer science). Awardees serve as models for their colleagues, inspiration to their communities, and leaders in the improvement of mathematics and science education. The following teachers have been selected as national and state finalists. 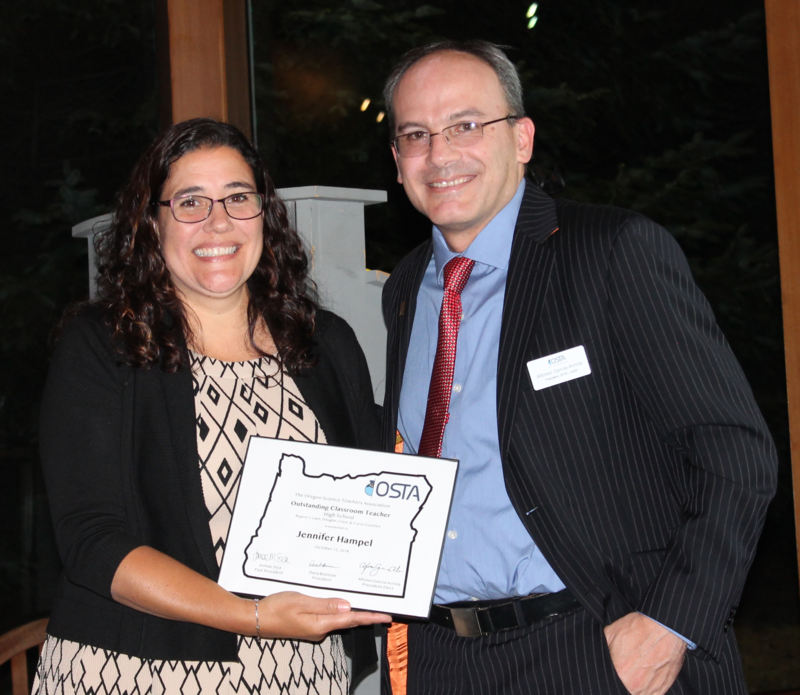 Oregon Department of Education Science Specialist and State PAEMST Coordinator, Jamie Rumage presented awards to Oregon's Finalists. 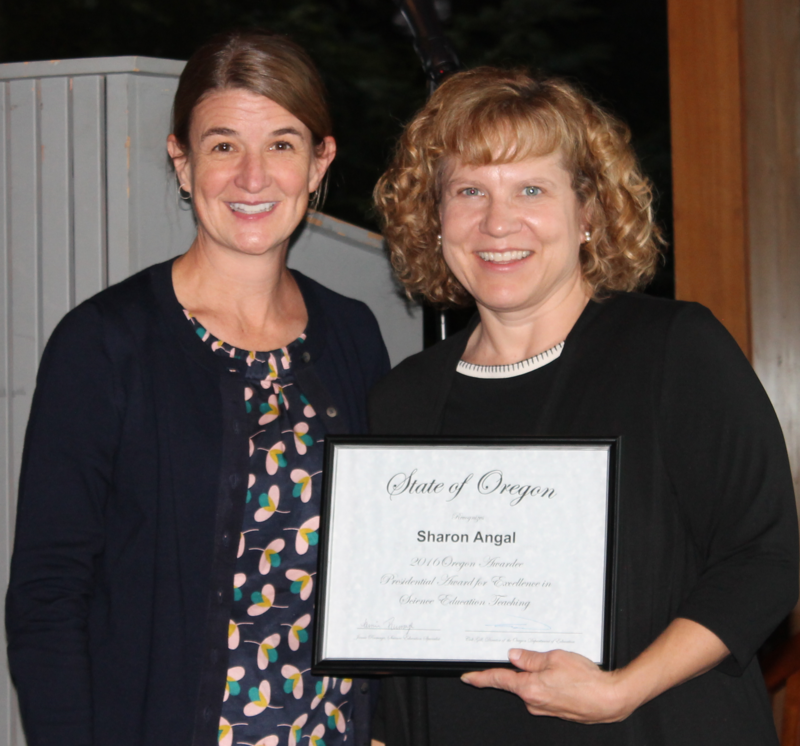 Sharon Angal has been an educator for the last 26 years. She currently teaches mathematics and science to third graders at Quatama Elementary School where she has taught since 2008. As the Teacher on Special Assignment, she serves as a science support for fellow teachers. Sharon likes her students to learn about real world problems in science, as well as see potential career opportunities that are associated with the science industry. Sharon uses place-based phenomena to make learning meaningful and relevant. She encourages hands-on activities and integrates multiple content areas to provide challenging, fun lessons. She is most proud of her partnership with the Oregon Zoo. This partnership has provided positive experiences for many of the students at Quatama Elementary. Sharon received the Crystal Apple Award for Excellence in Teaching from her school district in 2016. She has been awarded grants for innovative technology and science. Sharon has presented professional development at the local, state, and national levels. She co-authored an article in Science and Children, a National Science Teachers Association journal. Sharon earned a B.S. in elementary education from the University of Western Oregon. She has completed endorsements for English Speakers of Other Languages and Reading, and received a certificate for Instructor of Science Teaching K-6. With 38 years of experience in the field of education, Carol Biskupic Knight has an in-depth and integral understanding of the needs of classroom students and teachers through 28 years as a classroom teacher of 1st-7th grades. Her knowledge and experience in curriculum and instruction as a district science specialist, Science Partnership Teacher on Special Assignment, Elementary Science Curriculum Specialist and STEAM Coordinator brings a love and foundational understanding of effective science teaching, especially at the elementary level. Carol was part of the national and state level Next Generation Science Standards review and implementation teams and has developed professional development coursework, workshops and trainings for classroom teachers and informal educators on understanding and aligning instruction to the NGSS standards. With teaching certification in special education and talented and gifted, along with a focused study on English Language Learners, Carol has a strong passion to incorporate the NGSS Equity and Diversity lens into her work with teachers so that all elementary students have effective science instruction. 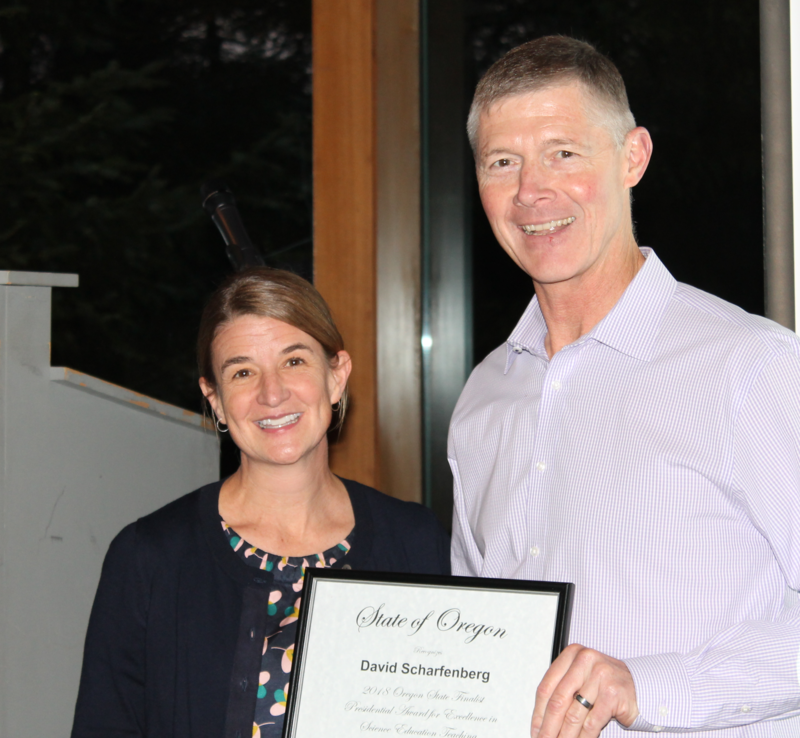 Her current position as STEAM coordinator at Sato Elementary School in Beaverton allows her to work with both teachers and students using the wonder of science and STEAM to engage students in a meaningful pursuit of knowledge and provide the impetus needed to promote literacy and language that is such a key focus at the elementary level. Born in San Diego, California, David went to a private college, earning a BA in Cultural Studies in 1982. Following that, he joined the Navy in 1984, and flew S3 Viking aircraft until his diagnosis of diabetes in 1986. Needing something purposeful to do with his life, he turned to teaching upon the advice of a close friend. That was the best decision he could have ever made. The main differences between being a pilot and teaching is that when the red lights start flashing in class, there is no checklist, and you don’t get to bail out! It is also way more rewarding. He completed his teacher training in 1991, and earned an MAT from the University of Portland. He currently holds Reading, Middle School Science, and Middle School Math endorsements, and recently finished participating in a three-year cohort of K-6 teachers. The focus was to improve content and pedagogy, as well as leadership with our peers in implementing the NGSS as they were intended to be. He believes in local, phenomenon-based science education, student citizen science, and developing young men and women who are passionate about understanding and taking care of the world we live on and in. Presenting the awards is OSTA President Alfonso Garcia Arriola. Duane Marshall was an outstanding career teacher from Newberg High School, active in OSTA, and an important contributor to science education in Oregon. This award in his name in intended to honor those individuals who, as classroom teachers, have made significant contributions to science teaching in their own classrooms and beyond. 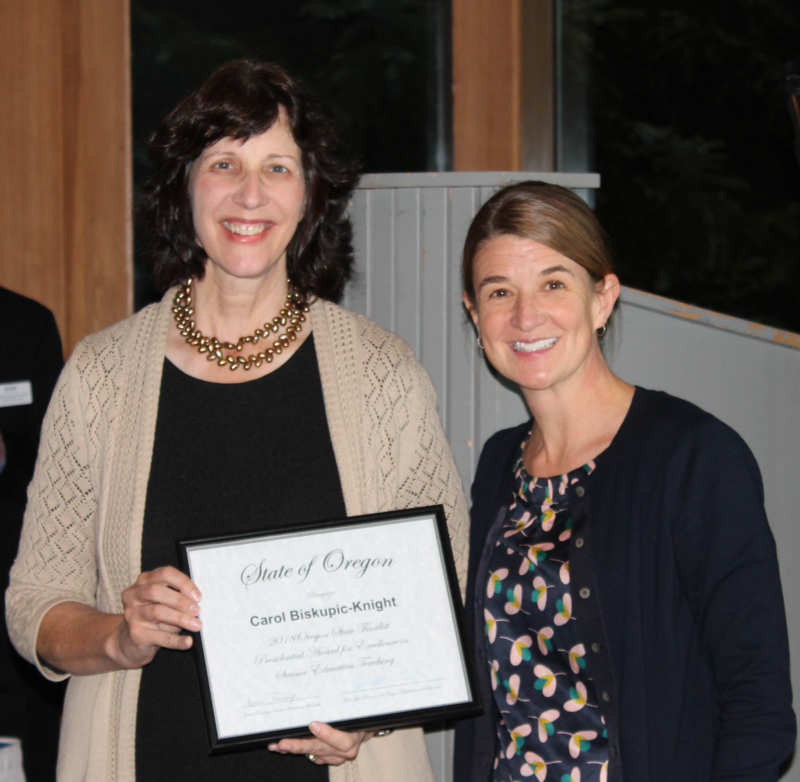 The awardee was selected based on career longevity and body of work, statewide and regional influence, enthusiasm for science, and the ability to motivate students and colleagues alike. 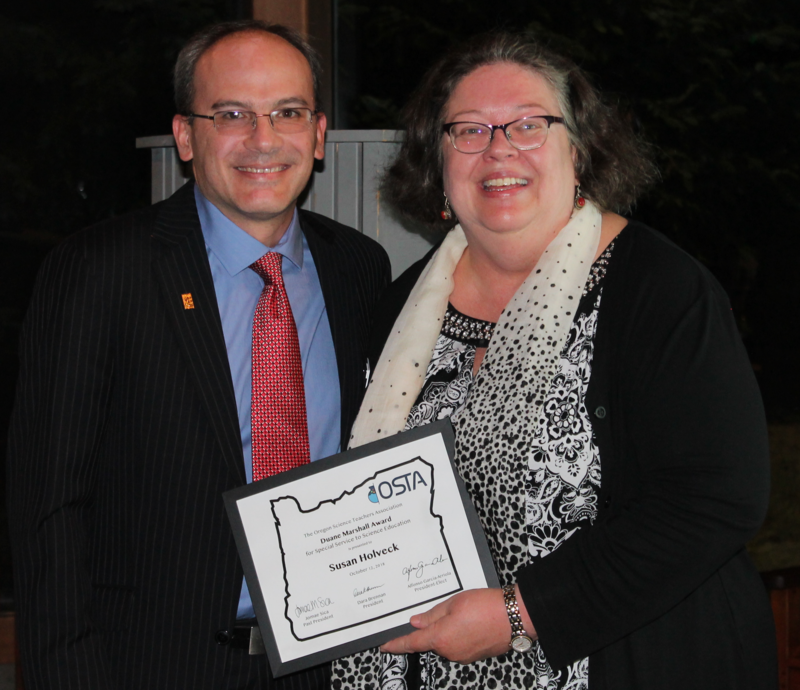 While Susan will undoubtably accomplish even more in her educational career, her current accomplishments and service to science education across the state of Oregon is deserving of this high honor. Listing her numerous accomplishments would run me over the word limit alone, so I will focus on her impressive ability to lead from in front and behind. At the district level she has ushered in one of the largest, positive shifts in instruction my district has seen (as observed by multiple 35+ year veteran educators). At the regional level she partnered, guided, and mentored other schools and districts to empower and support their teachers to make ambitious, impactful shifts in instruction and service to their students. 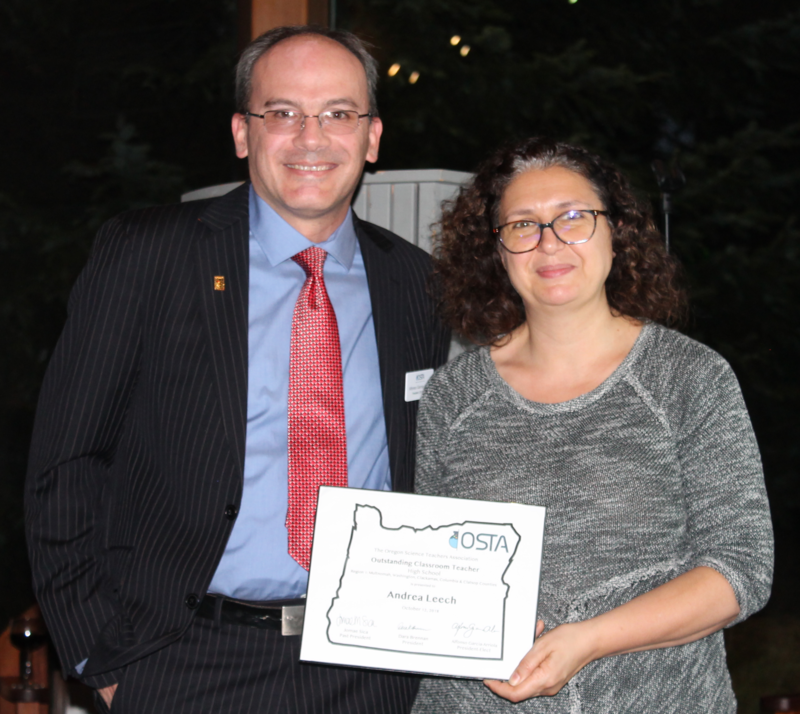 At the state level she has both help facilitate the Oregon Science Project and worked with the Oregon Department of Education to better align our state assessments with research based best practices and the NGSS. This award is named in honor of Fred Fox, a distinguished and well-loved teacher educator from Oregon State university (1957-82). The award is intended to honor those individuals who have made outstanding contributions to mentoring and developing new teachers. It is intended for nominees involved in teacher training programs at the college level, ESD, district administrators or other administrative positions. The awardee is selected based on career longevity, breadth of influence, enthusiasm for science and the profession of science education, and the demonstrated ability to motivate. After 20 years in the classroom, including teaching at Ashland Middle School, Linda joined the staff at Southern Oregon University in 1985. Working in the School of Education and the Environmental Education department, Linda’s classes include STEM Methods and Environmental Education. Her students lead the Fall in the Field program, field trips for K-12 students in Cascade-Siskiyou National Monument. They also assist with the August Institute, a teacher workshop sponsored by SOREEL (Southern Oregon Regional Environmental Education Leaders). 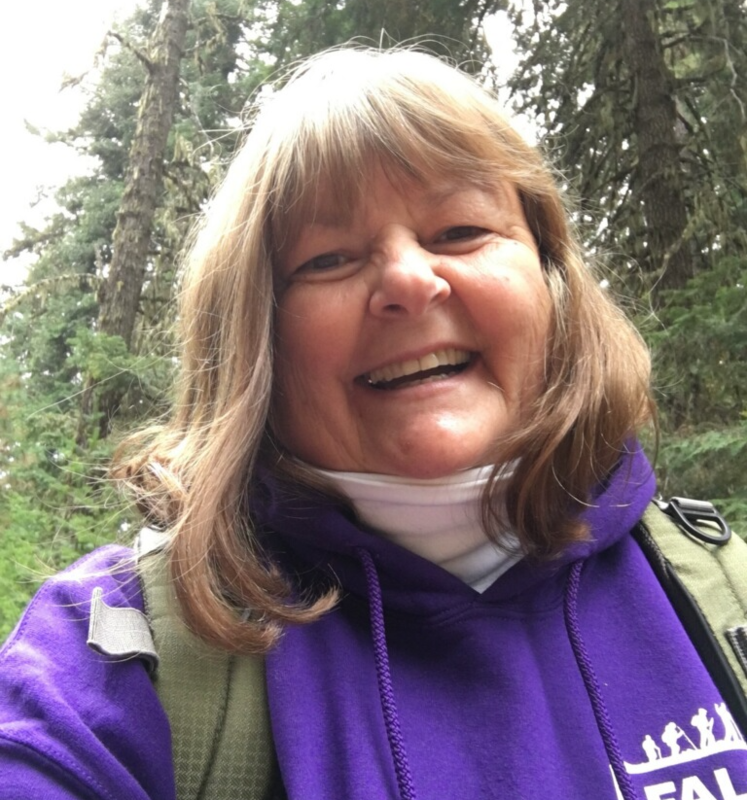 Linda’s passion is place-based education and teacher professional development to help educators use the outdoors as an engaging learning laboratory. 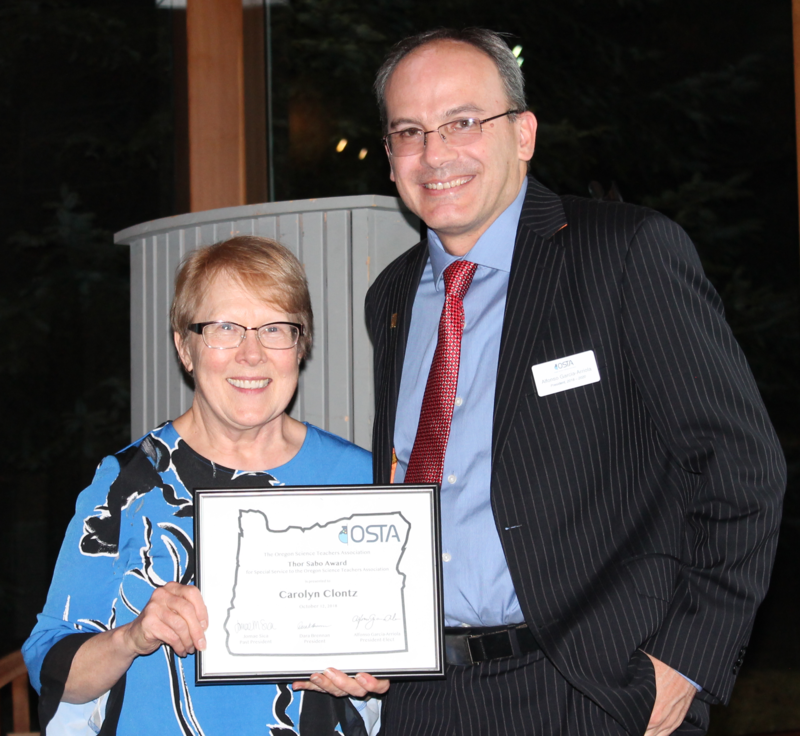 The Sunrise Scholarship Award was established by long-time OSTA Board Member, Lynn Mitchell. 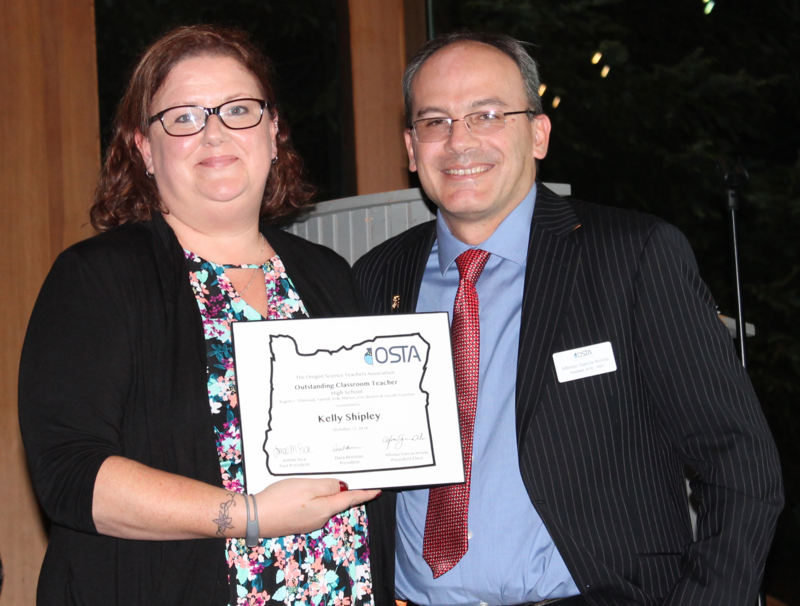 Lynn was a science teacher at Hood River High school, and spent many years on the OSTA board in a number of capacities. 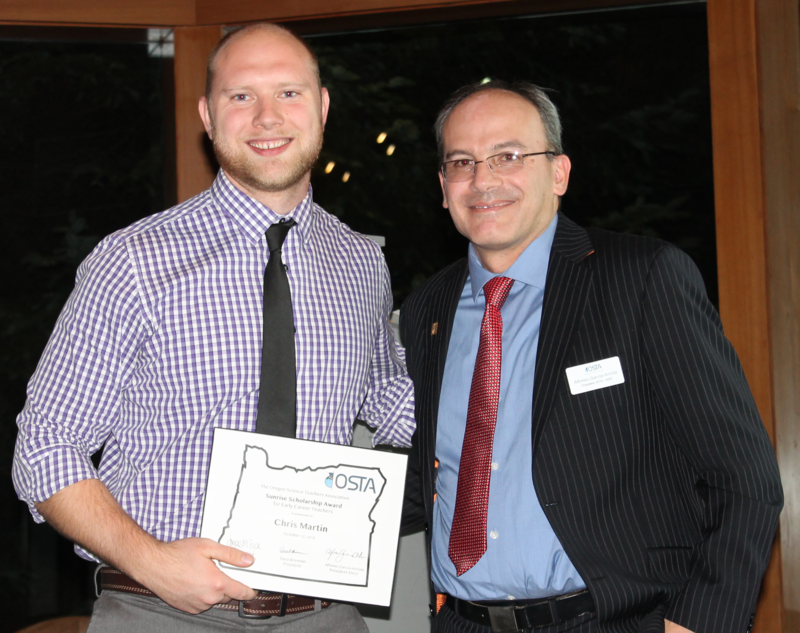 His vision for this scholarship was to support early career teachers to get involved with their professional organization, take advantage of the resources available through being a member, and setting the stage for the next generation of science leaders in OSTA. 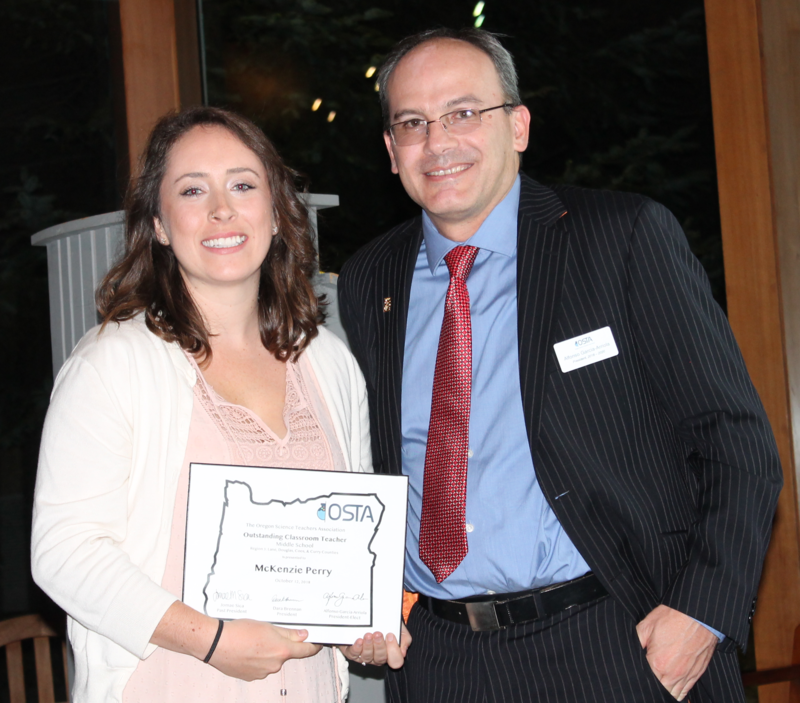 The Sunrise Scholarship is used to pay registration to attend the next two (2) OSTA Statewide Conferences, and a 2-year membership in OSTA. Chris is a very energetic teacher. He knows his subject very well, he illustrates great rapport with his students and pushes them to learn via interactive learning techniques and focused lab activities. The best part is he makes kids think by doing a number of varied "minds-on" processes - for instance; two truths and a lie that really engages their minds - which he uses either as an introduction for the day, or a closing. He is very charismatic and will be a great lead teacher as his career evolves! 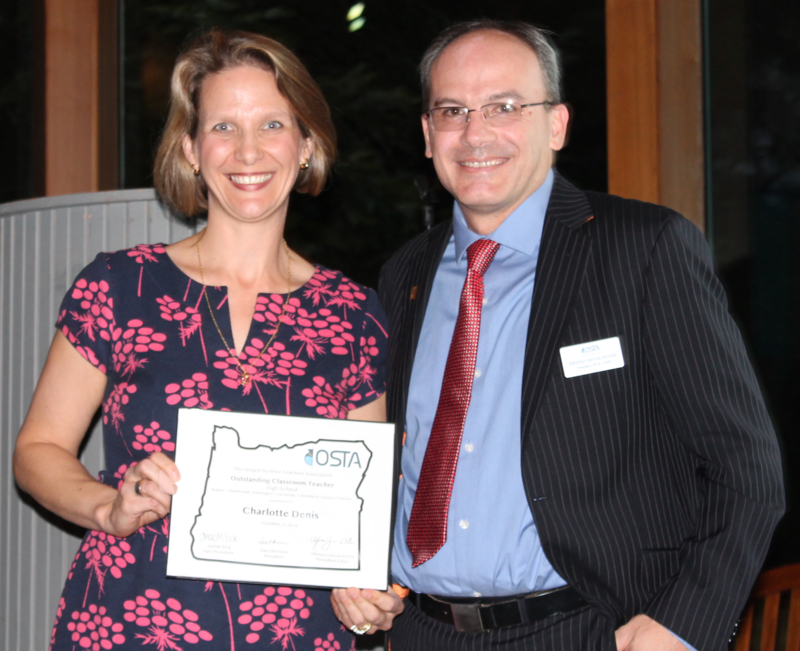 Carolyn has been actively involved in OSTA since 1997 when she was recruited to participate in a MSP Science Mentoring Program that was followed by an OSTA Summer Science Leadership Program. She has served as a Regional Director, President, Comptroller (prior to OSTA’s Treasurer), and has worked on numerous conferences. 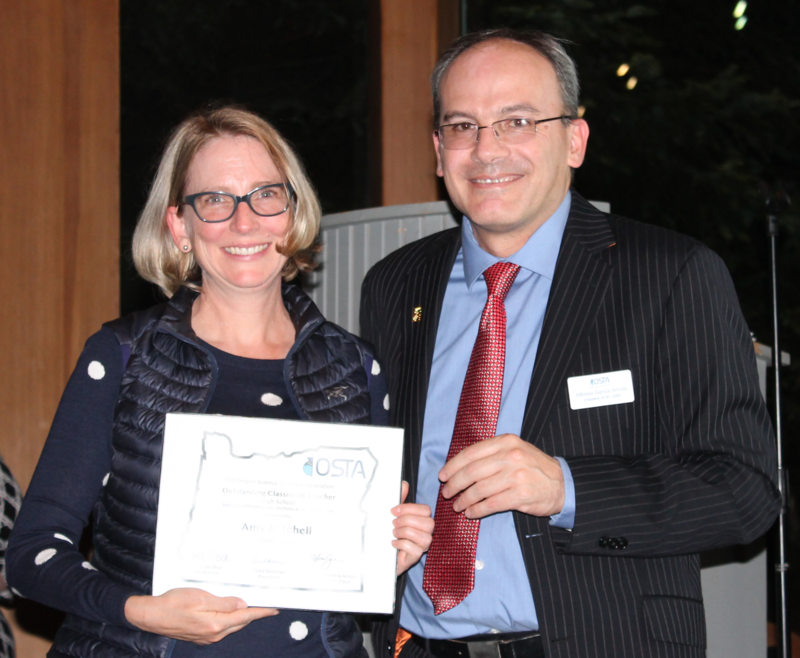 After she retired from OSTA in 2012, she was recruited back into service when the organization underwent some major changes in governance in 2013 and filled in as the interim comptroller until the new bylaws created the elected position of Treasurer. And, if that wasn’t enough, she ran and was elected to the new Membership Coordinator in 2014. 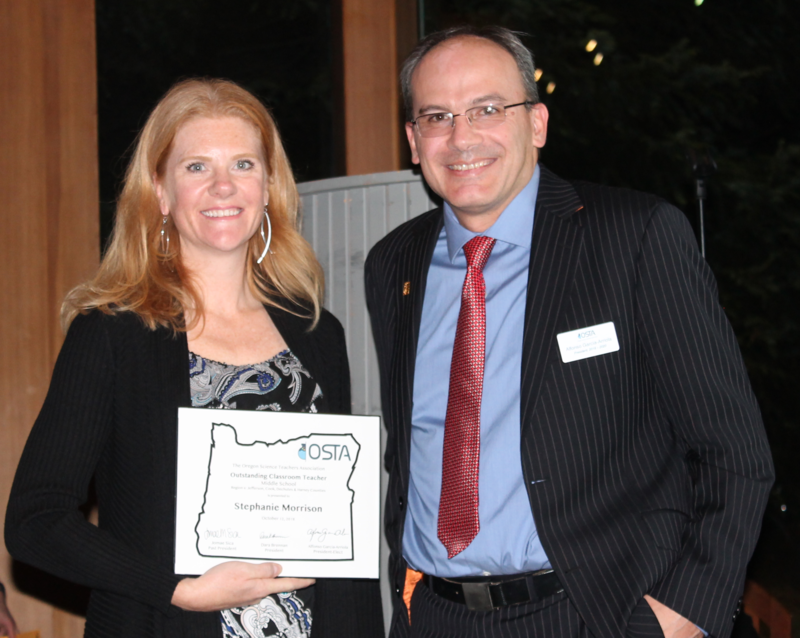 Carolyn has served OSTA by providing back end support for membership and events, while providing valuable institutional history that has helped newer board members understand the organizational thinking for past initiatives and activities in order to move forward with the 2016 Strategic Goals. These awards are meant to recognize and honor the work of outstanding classroom teachers in the categories of Early Career, Elementary, Middle, and High School. From every region in Oregon, awardees are selected based on their ability to motivate student achievement and excitement in science. Andrea has worked diligently over the past several years to transform her practice to support a student centered classroom. She has been honing her skills of facilitating student discourse so that she can scaffold student labs and activities in a way that allows them to utilize the practices to discover why chemistry is relevant to their lives. She has also started to lead other teachers in Portland Public Schools in this journey and advocate for district level supports that will ensure teachers are successful in this transition to implementing the Next Generation Science Standards. Charlotte is an incredible educator and leader for our district and state. 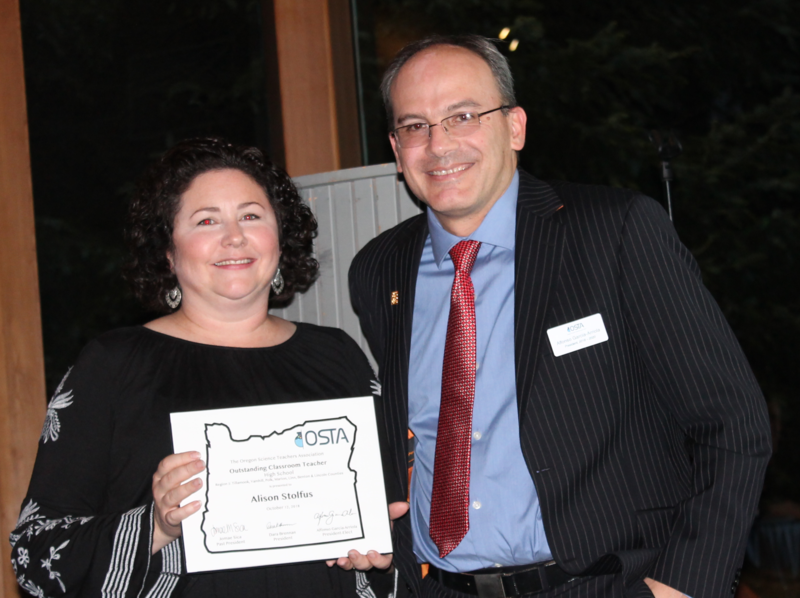 She has helped develop and provide professional development on our district/regional biology curriculum, been a tireless advocate for underserved students, and collaborated with other leaders to help move science education in Oregon forward. Charlotte has great skill in both her classroom and as an instructional leader. One of her specific strengths is in her support of curricular and instructional work to support ELL students. She is also very engaged in the work of NGSS implementation, always asking the question of how she can have students engaging in authentic inquiry and engineering tasks. She has developed multiple engineering projects as well as investigations that she shares with biology teachers across the state. Stella is an exceptional teacher. She engages her students with a positivity and enthusiasm I have rarely seen as an educator. Students in Stella’s class excel because she has extremely high standards for them and her upbeat demeanor. In addition, Stella possesses a strong sense of social justice, ensuring that all of her students are successful at Health & Science School (HS2). Stella currently teaches 7th grade Science; however, she has also taught Health Science CTE and High School Physics as well at HS2. She possesses a high level of science knowledge, but even more impressive is how her students apply their knowledge. Last year, Stella’s 7th grade team created a dynamic unit on Natural Disasters, which was accompanied with a full open presentation by Beaverton City officials, parents, and other community members. This summer, Stella served as one of our science teachers for the Beaverton School District ELL/Migrant Middle School Summer Program. Her students learned basic engineering principles and then applied that knowledge to build a boat of cardboard that must be able to float on of the teachers on staff. Stella is a phenomenal teacher and often inspires me to improve my own practice. Katrina is unbelievably good at what she does. She is kind, thoughtful, patient, even-keeled, professional, extremely efficient, engaging, forward-thinking, and innovative. She has been in Science Leadership positions in Portland Public Schools for many years (PPS Science Toolkit in early 2000s, SEPUP adoption committee, SEPUP trainer and Integrated Science development committee) and has been actively involved in developing NGSS-ified SEPUP materials. Indeed, she is one of the authors of the newly produced SEPUP NGSS Plate Tectonics textbook. She is more productive than any other teacher I have ever worked with, and is constantly improving her already excellent strategies of getting kids to be aware of their thinking and learning. She is far overdue for an award for her expertise. Tyler is a phenomenal science teacher with a genuine heart for students. He has taught both of my sons and is an expert at differentiating instruction for students. Tyler has brought a strong STEM-focused mindset to a rural school district that definitely needed to increase the rigor and relevance in its Science education. Tyler has also attended Sheltered Instruction trainings and has a sincere desire to improve his methodology to reach every student and help them become successful academically. His nominator, Jeffrey Crapper, said, "Having a son that has both an ELL and SPED designation, I am incredibly grateful for Tyler and everything he did to make sure my son succeeded in his class." Alison is an outstanding teacher. She tirelessly works with students of varied backgrounds and makes them enjoy science! She does a super job of maintaining positive discipline in her classroom while still making thing fun for her students. She has developed the Environmental Biology program into a year long class and excels at field work. Plus, since 4 of the old guard retired, she has taken the torch and is leading the way for the science department. Kelly Shipley goes above and beyond every day for her students. As a phenomenal science teacher she is constantly striving to provide engaging, relevant and enriching experiences to her students through the lens of inquiry and design. Beyond her Biology and Physics teaching load she has also built a program in which she creates equitable experiences for our students with learning disabilities in her Accelerated Science course (the accelerated department is our joint SPED/EL department). Through this course she teaches some of our historically underserved populations the wonders of Biology, Physical Science and Environmental Science. The strong relationships that she establishes with her students allows them to place trust in her that she will guide and support them through their challenges. I have seen her Accelerated students outperform their on-level peers on several occasions and I know that a lot of that credit goes to how hard and determined Kelly is to provide her students with the most positive, enriched and well planned lessons she can everyday! Carrie has brought a sense of rigor and passion for Science education that I have not seen in Dayton High School during the past ten years I have lived in the school district. She inherently knows the needs of her students and is a master of differentiating instruction to make sure they are successful. My son, who has both ELL and SPED designations, thoroughly loved her class and was successful due to her sheltered instruction techniques that she has implemented into her lessons. Carrie does an amazing job chunking her lessons and assignments, without compromising the academic integrity of the lessons. She is definitely an accomplished Science educator and deserves this honor. 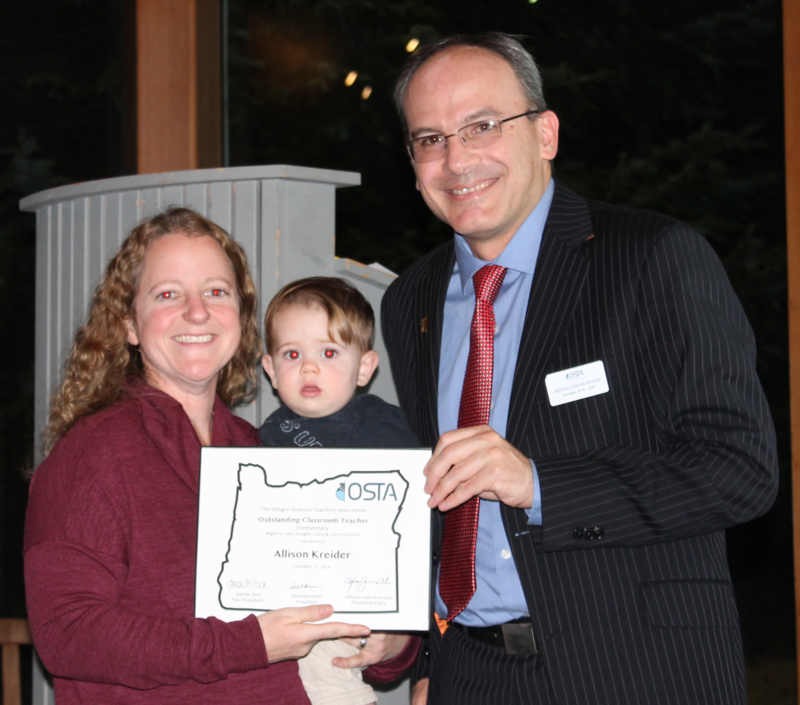 Allison Kreider has been Eugene School District 4j's Elementary Science TOSA for the past two years through a curriculum adoption. She has been instrumental in leading our elementary science teachers through navigating NGSS, how to use the new curriculum and the importance of elementary students "doing" science. She organized many "phenomenal" trainings, not only with FOSS, but with district science teacher leaders, as well. She went out to schools and worked directly with teachers and modeled science teaching in classrooms. Her passion and enthusiasm cracked even the toughest nuts when it came to the many excuses of why there was not time to teach science. She was an integral part of our 4j science team contributing to 4j's K-12 science storyline. Her innovation, dedication and moxie have made a huge difference in our district in regards to science teaching and learning of our elementary schools. McKenzie Perry is the perfect advocate for the power of the Siuslaw Stream Team: once a student, now spearheading the incredible project-based, local ecology program in her own classroom. When Mrs. Perry was a middle schooler herself, she participated with enthusiasm and wonder as her teacher led her out of the classroom and into nature, where real scientific learning comes alive. Not only did this inspire her as a young person, it led her on to her career path, and today she passionately leads her own 6th grade science students in hands-on inquiry-based lessons out in the field collecting water samples, studying fish and macro-invertebrates, and discovering how stewardship of local ecosystems leads to better health for their homes and communities. Just as she did, her students constantly speak to how much they gain from Stream Team, and how inspired they are to continue to protect the amazing ecosystems around their coastal home. As she uses strong community partnerships with governmental and non-governmental agencies, innovative and creative NGSS-aligned curriculum, and her own personal testimony to drive the team, McKenzie Perry deserves to be honored as a truly outstanding science educator. Of all the courses offered in our five-person Science Department, Jennifer teaches half. She led the charge to implement Patterns-based Biology and is polishing it this year. She took Coastal Ecology, formerly a goof-off elective course with a scattered curriculum, and made it a vehicle to expose students to the fields of forestry, wildlife management, and fisheries biology. She volunteered to bring the Healthcare Careers Pathway to our school, although it meant getting a CTE license and taking additional coursework to become a Red Cross Certified First Aid Instructor. Splitting her time with the Health PLC, she took the community college curriculum for Healthcare Careers, Medical Terminology, Medical Ethics, and Body Structures and Functions and adapted it for our high school. In addition to teaching 5-6 different courses per year, Jennifer is the co-advisor for Science National Honor Society, has served as a Science Bowl coach, and is planning to add an after-school science club and a Salmon Bowl team to our high school this year. In addition, she is raising two high school age children and helping her husband run their small business. I’m honestly not sure if she sleeps. Jennifer deserves recognition for all her hard work. Jen is a hard-working and dedicated powerhouse. In the 4 short years she has been in our district, she has revitalized our science electives, especially Coastal Ecology, and she has transformed our Anatomy and Physiology course into a dual-credit Body Structures and Functions class that is the centerpiece of a Healthcare Career Pathway. As our department has focused heavily on improving our core curriculum, Jen has taken on more than her fair share of preps for the good of the department. She has sometimes taught 5 different courses per term just because that was the only way those courses could be offered in our small school. In addition to all of that responsibility and hard work, Jen has written grants for supplies, attended professional development, and maintained a calm and cheerful demeanor that colleagues and students adore. Kacy teaches at an alternative high school in the Medford School District. Many of his students face personal and academic challenges that make traditional classroom experiences unsuccessful for them. As he begins his fifth year of teaching, Kacy continues to bring excitement and a fresh perspective to his students' science experiences. Besides teaching integrated science, Kacy worked collaboratively to create a new wilderness culinary class. Kacy also offers outdoor education classes to his high school students, offering the opportunity for his students to earn college credit in backcountry skiing, wilderness first aid and avalanche rescue. (https://www.southernoregonmagazine.com/outdoor-adventure-leadership-southern-oregon-university) Kacy serves on Mt. Ashland ski patrol and plays ice hockey. Please consider nominating outstanding teachers for the 2019 awards. Stephanie is constantly in search of best practice for her students and tirelessly experiments with those practices. Her classroom is a model for productive discourse as students make sense of complex phenomena by modeling and revising their models. Perhaps what is most impressive is that Stephanie has followed the these trends that have emerged from NGSS and has been out in front of her own accord, well ahead of others in the region. She worked with a math teacher to create a longitudinal field study project in which her students travel to a stream restoration site to collect and analyze data and then compare that to an "experimental forest" adjacent to her school. She is a leader in the school, district, and region and a constant partner with OSU as she mentors science teacher candidates each year. Amy Mitchell is a phenomenal science teacher at Redmond Proficiency Academy. She primarily teaches 9th grade biology where she emphasizes scientific inquiry and applications that build student curiosity and foster scientific engagement. Amy incorporates current scientific events throughout her classes, keeping the content relevant and captivating her students with the fascinating world of science. Amy also teaches several elective science classes including, STEAM Project: Tiny House Design. Students in this class build proportional models of tiny houses that meet construction, environmental and aesthetic criteria. In the process, they learn engineering procedures and green building fundamentals. Amy is also the primary coordinator of RPA’s Sustainability Fair, a school and community wide event held annually at RPA to inspire increased sustainability. Students from 6th-12th grade complete sustainability themed projects and community businesses with sustainable practices or products participate by setting up educational exhibits. RPA school and community members from Jefferson, Deschutes and Crook counties are invited. It is an inspiring event to be a part of and Amy is really the catalyzing force behind it! Amy is a wonderful teacher who has been an inspiration to my own teaching practices many times over. I hope you will consider her for this award.